A few DIY ideas for a candle wedding centerpiece can help a bridal couple save money. This traditional wedding centerpiece creates a romantic ambience for a reception that's suitable any time of day. Multiply your supplies by the number of tables that need centerpieces for a bulk purchase. 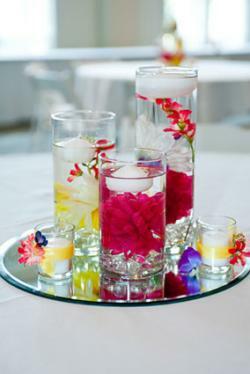 Utilize barware to create an easy centerpiece. Pick barware that fits your wedding style - margarita or daiquiri glasses for a beach wedding, wine glasses for a wedding held at a vineyard, champagne glasses for an elegant wedding - or you can group several different glasses together to create a unique look at each table. Make candles in your choice of barware according to the homemade candle making instructions. Using the glue gun set on low, attach two, three, or four floral clippings to the stem of each glass. Allow glue to cool. Tie ribbon around the bottom of the stem so that the knot will cover the spot where you glued the floral clippings to the glass stem. Make a bow with the ribbon you just tied. Place one to three glasses in the center of your table, depending on your table size and the number of glasses you made. Scatter additional faux flower clippings or blooms around the bottoms of the glasses, if desired. Instead of placing a few floating candles in a large bowl, use tall vases of varying heights to create a pretty centerpiece. Cut a length of ribbon off the roll so it fits around the votive holder with approximately two inches extra length. Tie the ribbon around the center of the votive holder. Attach floral wire to small-sized flower heads and attach to the knot in the ribbon. Use your glue gun and glue as needed to affix the ribbon and flowers in place. Add a votive candle to the holder. Repeat steps 1 through 5 for the second votive. Cover the bottom of each vase with clear beads. Add a large bloom to the small vase. Add two large blooms and one cut stem to the larger two vases. Fill with water approximately 2/3 to the top of each vase. Add the large floating candle to the top of the tallest vase and the two smaller candles to the other vases. Place the mirror tray in the center of the table. Arrange the three vases in the middle of the tray in a triangular shape; the two taller vases should be behind the smaller one. Add one votive to each side of the smaller vase. Tweak vase and votive positioning as necessary until it looks even. Large pillar candles don't require a lot of fuss to look good. Place the pillar candle in the center of the vase. Add clear glass beads until the bottom is covered and the pillar candle stays in place, approximately 1/2 to 1 inch up the candle, depending on candle height and size. Set the vase with the candle inserted on top of the mirror in the center of the table. Scatter greenery on top of the mirror and around the vase. Scatter flower petals on top of the greenery and onto tabletop. Place tea lights around the edges of the centerpiece. Adjust tea lights and flower petals as needed until it looks good. 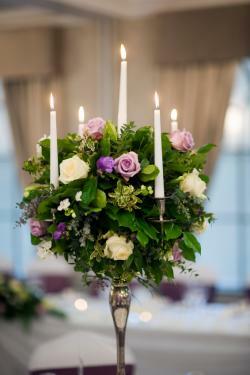 Incorporate tapered candles into your floral or topiary centerpieces; simply ask your florist when discussing ideas. Scatter tea light candles down the center of a rectangular table on top of a table runner, accented with silk flower petals. Choose a decorative candle holder for a themed wedding, like one with ornaments at a Christmas wedding or a bird cage for an outdoor garden wedding. Create a rustic feel by using imperfect homemade candles, either made by the bride or purchased, at a country or western wedding. 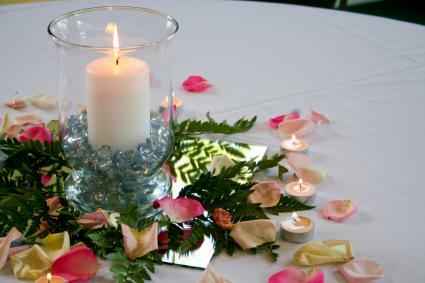 Place several small votive candles in holders next to floral centerpieces. Set votive and tea light candles on a long plate that is in your wedding color. Add small pebbles or beads around the candles and place on rectangular tables. Whether you choose to make a large centerpiece with floating candles, a simple pillar centerpiece, a unique centerpiece using poured candles, or another idea, don't forget to bring your matches. The celebration won't be complete until your centerpiece is lit for all your guests to enjoy.